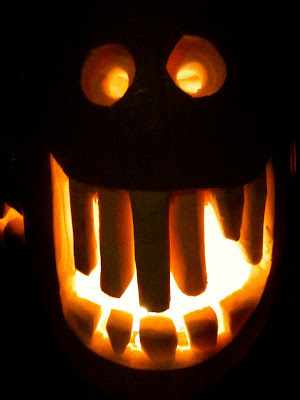 I am a big fan of jack-o-lanterns. I love the process of making them, and the finished products. 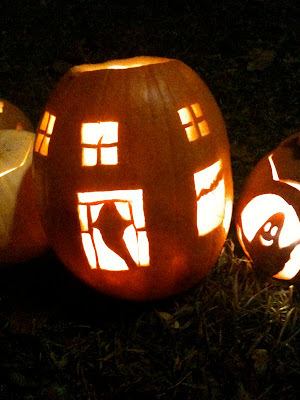 Beautiful warm glowing lanterns that light the path for the many trick or treaters on Halloween. I find it quite sad that they have a limited lifespan. Between the frost, and the squirrels, and the occasional teenager, they barely make it until the next compost pick-up. This year, a neighbour told me that I should bring my lanterns the day after Halloween to Sorauren Park. A night in the park to show off your creations, and wind through the paths completely lined with loads and loads of lit jack-o-lanterns. The parks team takes all the used lanterns the next morning, and composts them. We hauled our pumpkins to the park, and found a space along the path to display and light them. We spent the next hour or so wandering around the park along with hundreds of families admiring the lanterns. Photos and movies were being filmed, and people were posing with their favourites, gathering ideas for next year's jack-o-lanterns. We went back to our 5 jack-o-lantern contributions, to say goodbye, and there was a lady posing beside one of ours saying "I made it". While I was secretly giggling in the background, my son yells out loud, "you didn't make that one, my mum did!"